Activated charcoal isn't new, but is it really as magical as its marketing claims? During a recent trip to Ulta Beauty, on a mission to find a new facial cleanser, I was struck by a trend I observed on the shelves: Activated charcoal as a major ingredient in skin-care products is a big thing right now. There were soaps, facial masks and scrubs in unexpected, deep-black hues by nearly every major brand. With heightened curiosity, I picked one claiming its inclusion of activated charcoal would "draw out and trap 2x more dirt and impurities than a basic cleanser, for deeply-cleaned, tingly smooth skin." After all, I'm not alone when it comes to dealing with annoying blackheads and oil-clogged pores. Not long after making my purchase, an ad popped up on Facebook to tell me about an activated charcoal-based toothpaste (see "Black to White?") that asserted it would naturally remove stains and whiten teeth. It showed a model with her lips bared, and a mess of pitch-black foam spread across her teeth. Activated charcoal in personal care products suddenly seemed like it was everywhere, but why now? Of activated charcoal's other uses, one of the more well-known is to treat drug overdoses and the ingestion of poisonous substances, by adsorbing toxins in the stomach before they enter the bloodstream. Activated charcoal is also used in chemical spill cleanup, air and water filtration, and numerous industrial processes. It should not, however, be confused with the charcoal briquettes in a barbecue; the "activated" trait comes from a process that uses heat, gas and/or chemicals to alter the charcoal's physical structure to become more porous. In skin-care applications, activated charcoal is being used because these traits allow it to "trap" dirt and oil — it's sort of like a carbon magnet. But how well does it actually do this? "It's basically awesome for getting into pores and sticking to dead skin cells, excess debris and sebum [oil secreted by pores] — that's why it's popular," says Stephanie Guerra, whose Spokane-based natural skin-care line, Kani Botanicals, includes a few products containing activated charcoal. Because activated charcoal adsorbs most organic substances it comes in contact with, Guerra says that some skin-care products containing it might not be doing much, if any, extra work. Other ingredients in, say, a face wash, might have already been adsorbed into the charcoal, and thus there's little left to do the job of cleaning your skin, she explains. "Once it's wet, the 'pulling' power starts to lessen over time," Guerra explains. She's seen this happen when developing her own products. Kani Botanicals' Black Magic ($28 for 2 ounces) activated charcoal mask was originally formulated as a wet product, but Guerra soon realized it didn't have much of a shelf life because even the natural preservatives she'd added were being adsorbed by the charcoal. "It was super-temperamental," she says. The scent of any added essential oils also diminishes in time due to the charcoal, which Guerra says is actually "a good sign for real, activated charcoal, because it should start to do that over time." Dermatologists' views of activated charcoal's applications in skin care seem to be quite mixed; some have commented in articles on the trend that it's not ever going to be as effective as chemical treatments, but many also agree that if users think it's working for their own skin-care needs, they shouldn't necessarily stop. Longtime Spokane dermatologist Dr. Philip Werschler agrees that there's no harm in using products with activated charcoal on the skin — it's a form of natural carbon, of course — and he believes that various product forms can offer benefits, even if there isn't a proven physiological benefit. Werschler adds that he's personally tried some of the activated charcoal soaps out there, and likes the gentle exfoliating properties the soaps offer. "The bottom line in cosmetics is if you like [products] and you think it's helping and it doesn't irritate your skin, then go ahead and keep using," Werschler says. "It's hard to say [charcoal] is better than another product — it's easier to say it's safe and effective — but it's an alternative and it's a very natural product, and people today more and more like natural products." Kani Botanicals, for example, is made exclusively from organic and all-natural ingredients, making it vegan-friendly. Guerra founded her company in 2015 after years of personal skin issues she struggled to find solutions to, including allergies and acne. She's made sure that the activated charcoal she sources for her products is from an ethical source — it's made from burned coconut fiber that was dried and treated, and is pesticide-free. In addition to the charcoal mask, Kani Botanicals also offers a charcoal body scrub with sea salt, called Black Sea ($30 for 8 ounces). More abrasive than a sugar scrub, Guerra says the sea salt helps slough away dead skin; just don't use it right after shaving, she cautions. 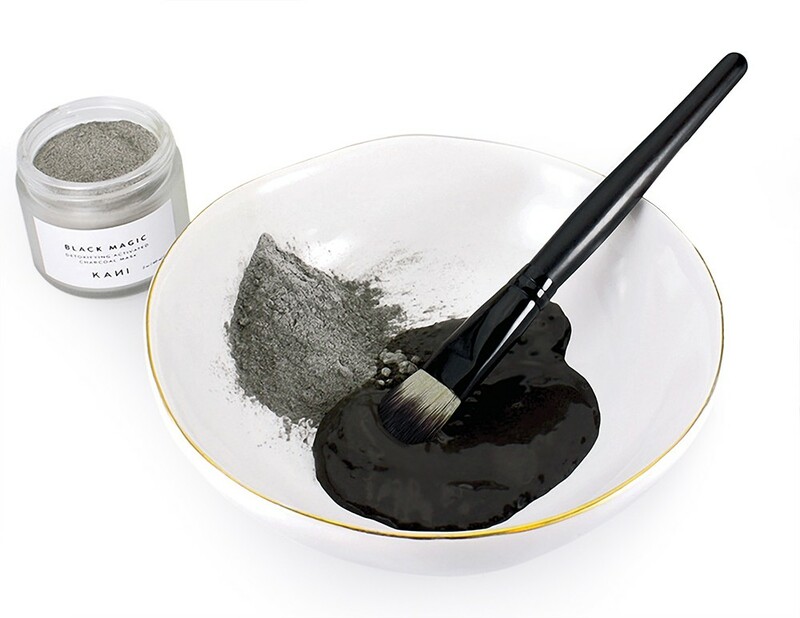 With her charcoal face mask in powder form, customers can mix a small amount of water — or, if they're looking to reap the natural benefits of lemon juice, yogurt or a banana, it can be mixed with those ingredients, too — to control the consistency of the mask. With a clay base, the mask can be applied at any thickness before being left on the skin to fully dry before being rinsed off. Find Kani Botanicals at kanibotanicals.com, and at the Window Dressing Pop-Up Shop, 159 S. Lincoln. Despite its off-putting, deep-black hue, there are many manufacturers out there claiming that activated charcoal can naturally whiten your teeth when you brush with it. Hold up before you fall victim to the hype, though. Windy Rothmund, a professor with Eastern Washington University's dental hygiene program, says there are few studies on activated charcoal's benefits in oral care, and she's skeptical until it's researched further, or approved by the FDA or American Dental Association (ADA). Rothmund says her biggest concern is that the abrasiveness could harm your tooth enamel and your gums, and that it could adsorb the good bacteria in your mouth, just as it does the bad. A promising sign for consumers, in Rothmund's view, is if or when the big dental-care brands, like Crest and Colgate, start adding activated charcoal to their products. "I'd like to see long-term studies of [activated charcoal] as an ingredient in toothpaste," she says. "We know it's safe in filtration, and safe for poison overdoses, but we don't know what it does in the mouth."